This fertile valley crossing into Lower Galilee and the Samarian Highlands of Israel is one of the most important agricultural regions in the Middle East. Vast expanses of fertile farmlands stretch out in the Jezreel Valley below the Samarian Highlands. This fertile valley crossing into Lower Galilee and the Samarian Highlands is one of the most important agricultural regions in Israel. The valley took its name from the ancient city of Yizre'el. 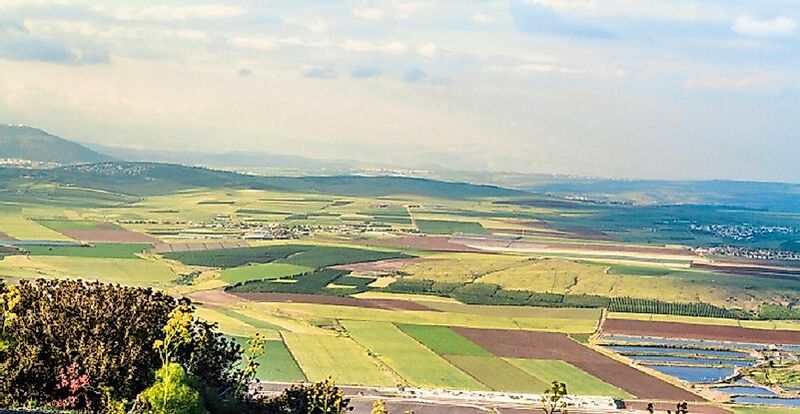 A large expanse of plains south of Galilee with Mount Gilboa on its southern edge. Two Israeli cities are located to its north, Afula and Tiberias. Its location also harbors the most natural springs in the area. On its western side is Mount Carmel and the Jordan Valley to the west. Traditional crops that were cultivated in the area are wheat and barley. Today these same crops remain the chief harvests of the valley. The valley was settled as early as the Chalcolithic Age (from 4500 to 3300 BCE) and into the Ayyubid periods from the 11th through the 13th Centuries. The valley was used as part of the routes from earliest times for peoples traveling through the Levant. Many famous ancient battles such as the Battle of Megiddo was fought in the area. Gideon also waged battle against the Amalekiltes, Medianites, and the Children of the East, ultimately winning over them in the valley. King Saul, however, did not survive his defeat by the Philistines in the vicinity of Mount Gilboa. Modern archaeological excavations show that the valley was also home to Late Persian, Early Hellenistic, Roman, and Byzantine Era peoples. In 1911, Jewish settlers started to cultivate the valley again after a long period of neglect by draining the swampy valley. The efforts of the settlers paid off with the greening of the valley again. Crops such as sunflowers, cotton, wheat, and barley contributed to the local economy. A number of fishponds also sprouted. Today, tourism is a significant partner in the valley's continued progress. There are also many attractions and tourist destinations such as the Tzippori and Beit Alfa National Parks, Tel Megiddo National Park, Circassian Village and Museum, and the Kfar Tabor and Kibbutz Ein Dor museums. Nearby Nazareth also has religious and heritage sites for the Biblical enthusiasts. Nazareth is said to be where Jesus's family hailed from, and Tel Megiddo is supposedly where the end times Battle of Armageddon will take place, per Christian beliefs. Agricultural land dominates the Jezreel Valley today. The mountains of Nazareth, Mount Tabor, Mount Carmel, and the Samaria Mountains all form natural borders around the valley. Most of the wild areas have all been converted to much-needed agricultural lands. Many areas are now also tourist attractions with restaurants, museums, and accommodations. Although several national parks have preserved the integrity of nature. There are grasslands for cattle and sheep that dominate the fauna. Agricultural land produces white beans, chickpeas, cotton, wheat, green beans, cowpeas, oranges, sunflowers, corn, squashes, and watermelons. Herbs and spices are also cultivated for the local market. The Jezreel Valley Regional Council oversees the valley area and some of its surroundings. The loss of habitats for the Collared Pranticole birds has diminished their numbers today to just 80 pairs. The main causes behind this loss of habitat is what has raised great concern for the Israel Nature and Parks Authority and the Israel Ornithological Center. The center has asked for the cooperation of the farmers to preserve and also make possible nesting sites for these beautiful birds as part of the ecosystem. Another concern by authorities are the many archaeological digs that are falling into neglect. The barrier setups are being stolen and non-maintenance of some sites also contribute to the overall deterioration of these irreplaceable records of humanity's inheritance. Vegetation growth also obscures the digs. What Is a U-shaped Valley? What Is A Hanging Valley? What And Where Is The Valley of Mexico?